"Community Totem" © 2009 by Peter W. Michel with the help of many children and volunteers. 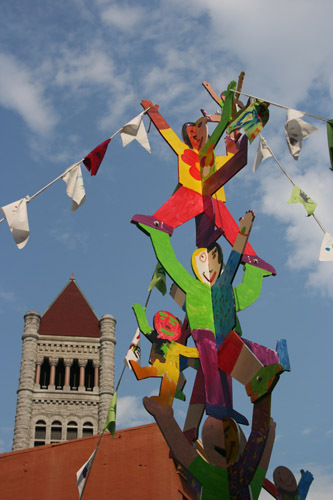 The Community Totem is an example of arts creating community. It does this in two ways. First, the visual metaphor of individuals supporting each other can spark the imagination and consciousness of what is possible: creating the kind of community where each indiviual is supported in thriving and being fully self expressed and each individual in turn contributes to a dynamic, vital, robust, and whole community. Secondly, the process is also a metaphor - the participation of the children and the setup team is a symbol of the power to accomplish the improbable that becomes available by working together. The lower part of the primed 22 foot tall wood totem was on display on Friday July 24th near Columbus Circle in Downtown Syracuse as part of the Syracuse Arts and Craft Fest. 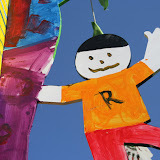 On Saturday morning, July 25th, the entire primed totem was set up at the City Hall Commons then taken down and the parts set up like easels which the children then painted. More photos can be seen on Peter's Picasa website also see slide show preview below. clicking on these images will take you to an enlarged view of the photo at the Picasa website where others are available as well. Many thanks to the Rosamond Gifford Foundation for its generous support of this project.